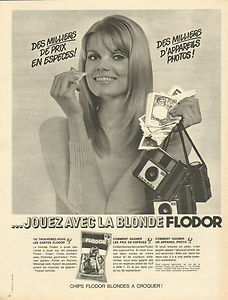 Flodor was founded in 1958, by Jean Breuder. His small production plant was in Peronne. In the early 1960s, Marcel Bleustein-Blanchet, the founder of Publicis created an innovative marketing campaign that would be now known as a ‘Teaser Campaign.’ It featured a blonde woman holding a Potato Chip. Rough translations, “Blonde Crunch” and “The Blonde Chewable” do not quite give the outstanding ‘mystery’ campaign due credit. The image appeared everywhere, had people asking what it was advertising and who the woman was - it was a major success. Up until that point Potato Chips were not a major snack food option in France, which is somewhat ironic considering that they may well have been invented there. After this campaign, Potato Chips sales increased significantly. Other Potato Chips operations sprung up around France. Flodor was absorbed into the Italian Unichips brand in 1990, before being liquidated in 2005. Unichips now manufacture the Flodor brand. ​The success of the Flodor 'Mystery Blonde' campaign sustains to this day. The newspaper advertisement on the left is from 1968.